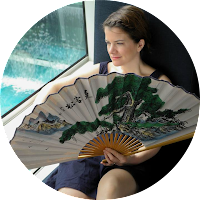 Portmanteau Suitcase: Take a Walk! I'm so excited because my sister is here! Hooray! After finishing a tough clinical rotation, she came up to visit me, her coolest (ok, only) sister and SMS! SMS and I went to pick her up at the San Jose Airport, which was a ghost town. We headed home and relaxed, ready for a fun adventure the next day. 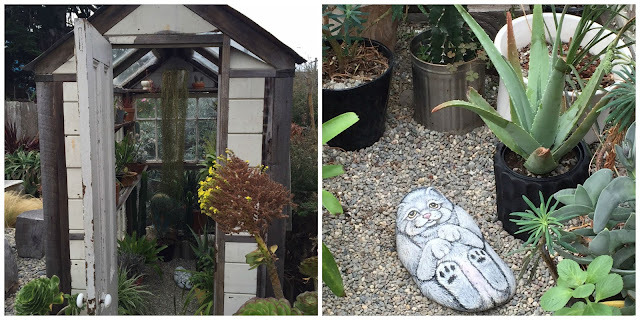 I just found an awesome San Francisco blog, 7x7 and I was inspired by their Ocean Beach to Presidio hike article. So Sunday morning, off we went! 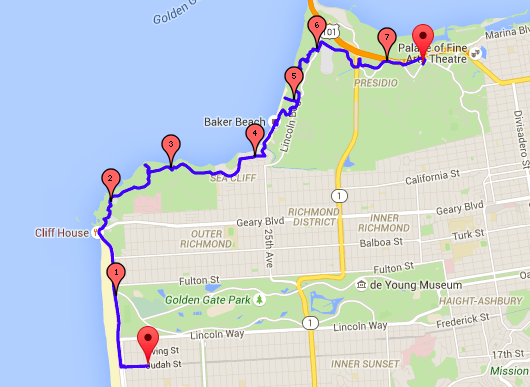 We followed the article pretty much to a T, but I mapped out the hike on Google maps before going. 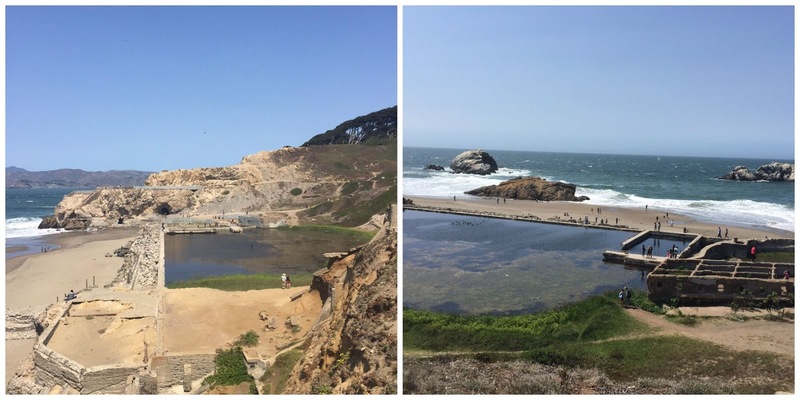 I'm glad I did b/c the article describes landmarks more than distances and it's nice to know that I wasn't adding extra to an already slightly lengthy hike (until we got to the Presidio, ooops!). The happiest dog in the world! So, SMS wasn't sure if we were ever going to start hiking and that's when we were off! We walked down to Ocean Beach and headed for the Cliff House. Along the way, we saw a lot of people and the world's happiest dog. It was a cute Pomeranian with long hair being blown straight back in the wind. It was a little camera-shy so he kept tottering away which was even funnier to see. 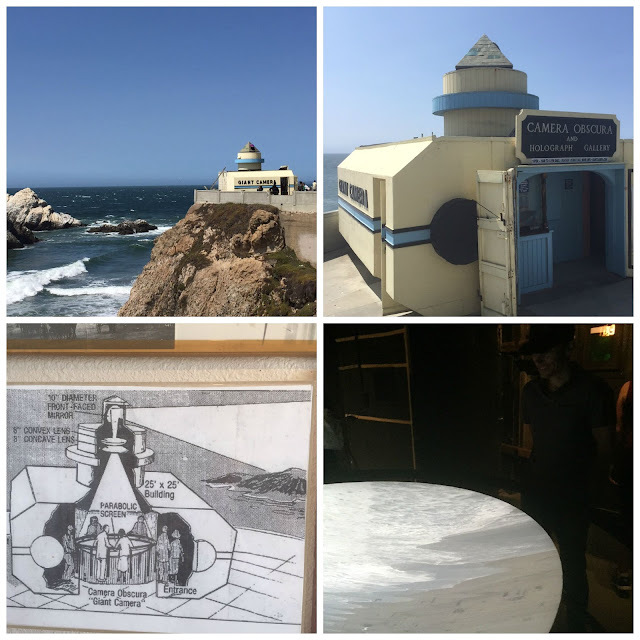 After reaching the Cliff House, we went behind to the Camera Obscura. It's based on the world's oldest camera, described by da Vinci but apparently around in even earlier writings. There's a open aperture that rotates 360 and the light that comes through projects on a surface inside a dark room. The picture is everted but otherwise a faithful reproduction. The $3 admission granted us access to the room which featured the image and several holograms (?). It felt slightly old-school and carnival-like and we were glad we stopped. After the Camera, we went inside the Cliff House to use the bathroom and then we were off to the Sutro Baths, a former indoor pool center now in ruins. It looked like it would have been a spectacular place to swim. The ruins were cool and we headed to the Sutros Bath Upper Trail which led to the Land's End trail. We missed the turnoff for the Eagle Point Labarynth, but apparently it was recently vandalized so we didn't miss too much. The viewpoints were pretty amazing though with great views of the Golden Gate Bridge. Although the day had started out with some high clouds, it cleared up at the start of our hike and we had fantastic weather the whole day. Views along the hike. On the right, the Sand Ladder with a nudist just off-camera to the right. You're welcome? After the Land's End trail ended, we were in the Sea Cliff neighborhood itself which is super-swanky with amazing house. 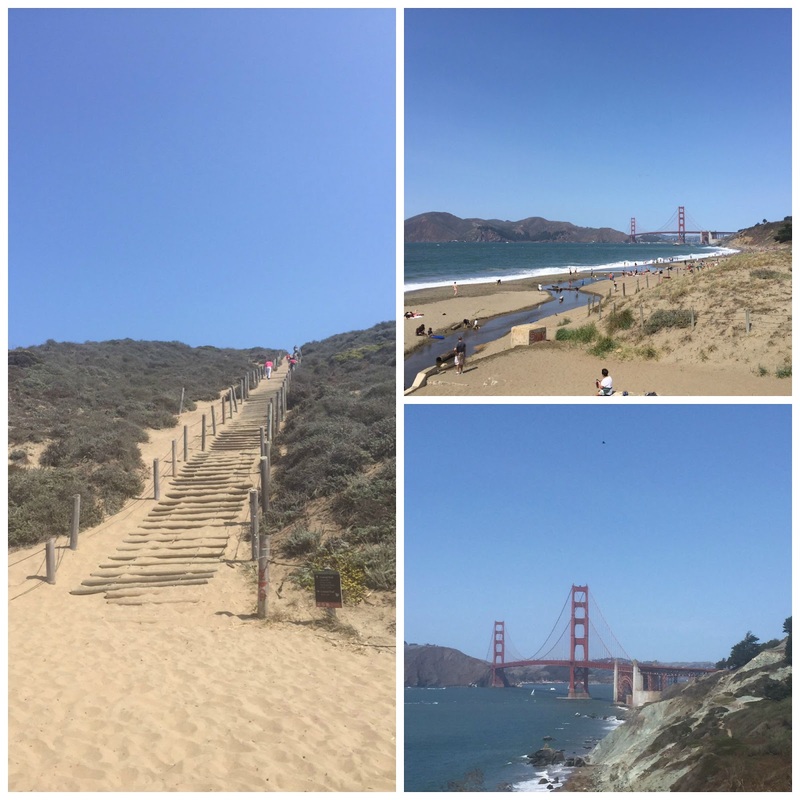 We turned onto 25th Ave to access Baker's Beach and we walked down to the Sand Ladder. This was where I was glad I had checked the map prior to setting off because the ladder was pretty far down the beach where there were several nudists sunning and it would have been awkward to keep walking back and forth ("What are you looking at?!?!"). We walked along some more trails past a few old gun batteries before heading into the Presidio. 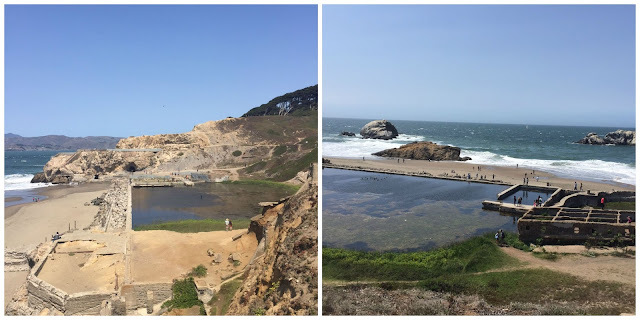 The Presidio was cool but there's a lot of construction so beware, if you walk by the water, you're not going to reach the main lawn without back-tracking or walking to the Palace of Fine Arts. 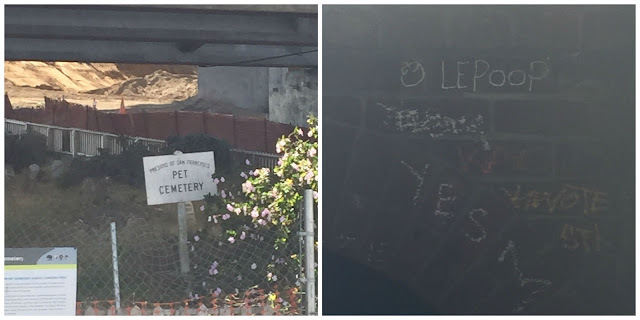 We did walk by a pet cemetery though so that was pretty cool! We walked along Chrissy Field and took some more pictures. At this point, I realized that we weren't going to make it to the main lawn since by this point, we were kind of done with walking. We decided to call Uber from Chrissy Field. It was our first time using Uber (B thought we were kidding) and it was great. Our $20 credit meant our long (time-wise, not distance) trip back to our car was pretty cheap. We decided to eat dinner in the city so we headed to the Mission District after realizing that the Anchor Steam brewery closed at 4, much to the disappointment of SMS who had wanted to add a stop there to our day's activities. We went to West of Pecos which was a great Tex-Mex sit-down place with a small front patio with a table open! Score! We got drinks and snack while waiting for Brady's friend Rosa since we weren't sure if we were going to restaurant hop for dinner. As it turned out, Rosa had been wanting to eat there for awhile so we had a delicious dinner there. 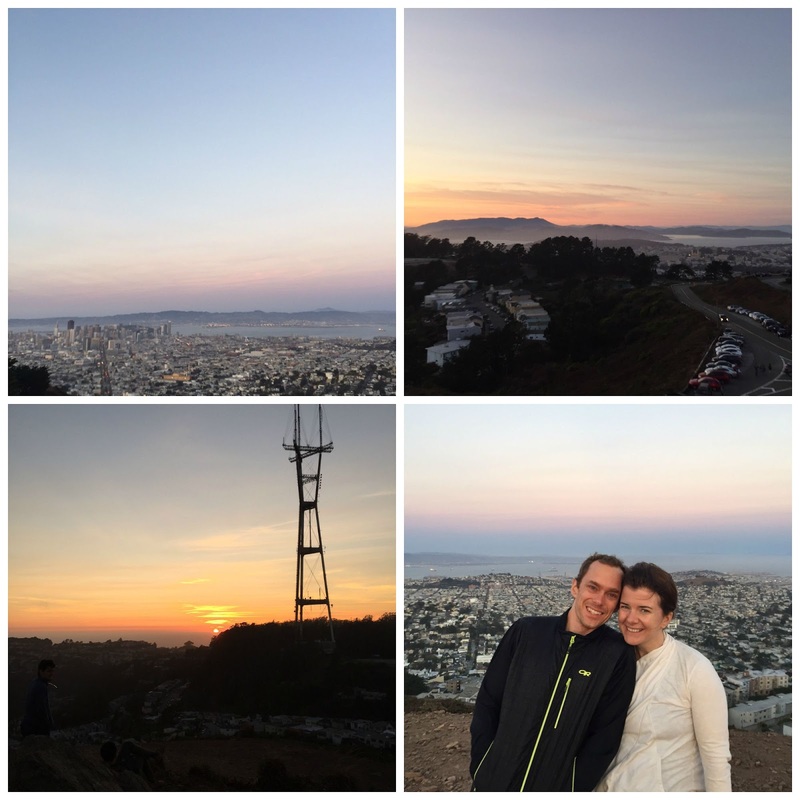 After dinner and feeling a little stuffed, we decided to race up to Twin Peaks to view the sunset. It was absolutely beautiful, as well as chilly and windy. It felt very magical to see all the different parts of the city and the entire bay but we only stayed for a bit before piling into the car to drop Rosa off and then heading home to Mountain View. It was an incredible day and I was so happy to explore new parts of the city with SMS and my amazing sister!